The rally community suffered a great loss yesterday when a competitor died during the third round of competition at the Olympus Rally in Ocean Shores, WA. Shown above before round one of the rally, Driver Matthew Marker did not survive injuries sustained during a crash. 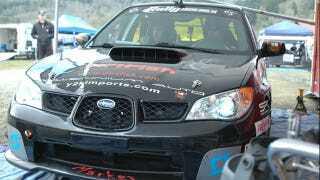 Co-driver of the 2006 Subaru, Christopher Gordon was not serious injured in the incident. Matt Marker was a national rally competitor and driver for the SubaRoots rally team. Racing was suspended Saturday after the tragic incident.